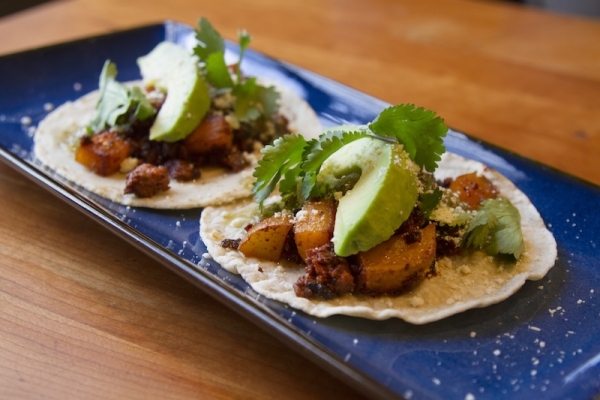 If I had to choose a single taco that I believe would have the greatest appeal, it would be chorizo-potato (with salsa verde, avocado and cilantro, of course). Chorizo is the bacon of Mexico. And we all know what magnetic charm bacon has. Rich and tender with deep-red chile, fragrant with herbs and spices, pleasantly tangy with a touch of vinegar, chorizo is the runaway highlight of this debut Taco Tuesday recipe. That’s not a slight to the onion-and-potato mixture that shares the same pan, or even the warm tortillas or roasted tomatillo salsa that accompany it, but c’mon, the sausage is star of this show. Street vendors throughout Mexico have served some version of this mixture for as long as anyone can remember. But you need not buy a plane ticket to Mexico — that sizzling chorizo magic is surprisingly easy to reproduce in your home kitchen. Here, we’re keeping the preparation super simple, utilizing the microwave to help steam the potatoes before adding them to the pan to soak up that amazing flavor of the chorizo. Keep in mind, this filling can be made a day or two in advance; cover and refrigerate. Reheat it in the microwave, in the oven covered with foil or in a skillet over medium to medium-low heat, adding a few drops of water if the mixture seems dry. Scoop the potato into a microwave-safe bowl, cover with plastic wrap, poke a few holes in the top and microwave on high for 3 minutes. Lay the chorizo and onion in a very large (12-inch) skillet (preferably non-stick) and set over medium heat. Cook, stirring frequently and breaking up clumps, until the fat renders, the sausage looks cooked, and the onions are translucent, about 6 minutes. Scoop the potatoes, leaving the steaming liquid behind, into the skillet and continue cooking until the potatoes are soft, about 5 minutes. If the potatoes begin browning long before they’re soft, reduce the temperature a little. Taste and season with salt if you think the mixture needs it—some chorizo is so highly seasoned, little additional salt will be needed. To serve, scoop the mixture into a deep bowl. Set out with the cheese, cilantro salsa, avocado and warm tortillas. Taco Tuesday great idea Rick!!!!!!! Can’t wait to see what’s next week taco dish! I love your food and everything you bring to us. You use fresh real food, yeah!! That why it really shocks me to see, with your high standards towards food, you still use a microwave. Rick – I saw one of your shows and you heated up some tortillas in a plastic bag in the microwave. What kind, how many, and for how long? Also, we just got a Fiesta market in the Texas town where I live. 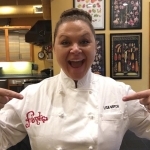 I’m so excited to find the authentic ingredients I need to make your wonderful dishes. Carla-I would put about 20 tortillas, wrapped in a damp paper towel put in the plastic bag (left open) and microwave for 1 minute.